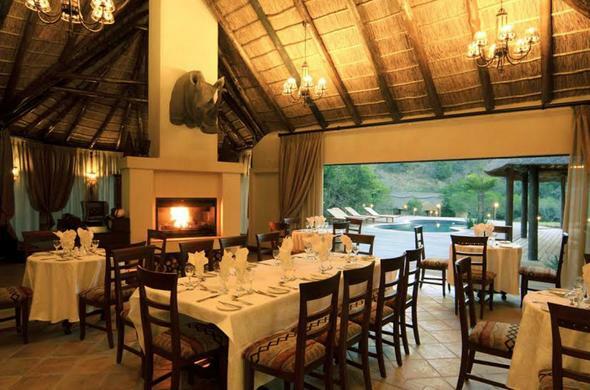 Close to East London, this Eastern Cape safari lodge has excellent facilities and 4 of the Big Five animals. On 3 200 hectares of conservation land and home to 4 of the Big Five game animals, yet very convenient to East London, this private game reserve in Eastern Cape has two lodges with great facilities. The name of the reserve is taken from the Umpongo River nearby which has great significance for the Xhosa community. Conference delegates, wedding couples, and holidaymakers can relax at Mpongo as it is located in a malaria-free zone. There are a number of waterholes on the reserve and bird life is excellent. Knowledgeable guides are experienced and the eco-tourist will find out interesting facts and information. Open vehicle game drives during the day stop for a refreshment and picnic break and usually take about 2-3 hours. Game animals that can be seen include Buffalo, Lion, Elephant and Rhino, also Hippo and Giraffe. Mpongo Private Game Reserve is a birder friendly establishment and many different species can be observed. Night drives are also offered as a variety of nocturnal game can be seen. Stylish Huberta Restaurant with subtle Xhosa decor is built around a waterhole with large viewing windows; guests can savour the blend of European and African cuisine while watching the Hippos which tend to linger by the water. More great service and hospitality can be experienced in the Buffalo Lapa (outdoor enclosure). Guests here can relax by the open fire and enjoy African dishes like potjie a type of tasty stew cooked over the fire in iron pots.